Breakfast is served - Monday to Saturday at 8.30am. Sunday & Bank Holidays at 9.00am. Earlier breakfasts by arrangement. Fruit juice, cereals and yoghurt are on the side for self service, including apple juice and fruit from our garden. Prunes and cheese are usually available on request. 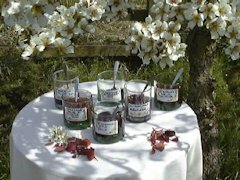 Home made bread and a wide selection of our own preserves are on the table with toast served fresh and hot. A cooked English or vegetarian breakfast is offered, with eggs from our hens, and bacon, sausages and other produce from local farms. Indian tea and ground coffee are served; instant coffee, other teas and infusions are also available. There is a wide variety of places to eat in the vicinity, from take-aways, through good pub food to high quality restaurants. 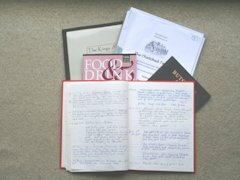 Our information library includes a selection of menus from local hostelries, supported by our own Guest Recommendation Book, to assist with choosing where to eat before setting out. We also research special offers, will ring to book a table for you and provide a map to help you find the hidden, but worth searching out, places to eat.